A cost effective solution to compliance, safety and care. Profiling beds are a big investment for any care home. Ensuring your home is compliant with current bed standards and the gaps and clearances stipulated within those standards is important. 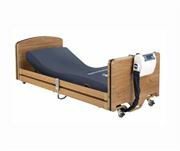 The carer low profiling bed from Renray is designed to meet these standards and when used with Renray mattresses complies with IEC60601-2-52 without the need for extra height side rails. With a unique height of 19.5cm, this profiling bed is designed to help the prevention of falls and injuries to clients. The simple to use variable height allows greater independent movement and transfers. Designed using 4 years’ of research on anthropometric data based on the Adult Social Care Survey 2009-2012. Over 227,000 people were surveyed looking at their age, gender, height, weight and mobility, we can guarantee top quality. The height, contouring and tilt functions are electrically operated via the simple to use, lockable handset. • Powder coated frame is smooth and easy to wipe clean. • Plug and play maintenance, all controls are easily accessible. • Head and foot panels are removable by one person and easily replaced. The Elite Mattress range and Squirrel dynamic mattress range are suitable for use with the Carer low height profiling bed. For more information on our profiling beds visit our brochure downloads page, call us 01606 593 456 or email us info@renrayhealthcare.com and we’ll be happy to help.